Vaaheguru Jee Ka Khalsa Vaaheguru Jee Kee Fateh! We are excited to announce that the SYANA Gurmat Retreat will be held from May 25 – May 28 , 2018 at YMCA Camp Storer in Jackson, MI. Join us for an illuminating weekend of Shabad Keertan, Gurmat Veechar, Workshops, Games and Self Reflection to learn and grow together on the path of Sikhi. The retreat is targeted toward Sikh youth between 18 and 35. Over the past many years, we have had the fortune to build a Sangat that has gone on to do great things for the Panth. 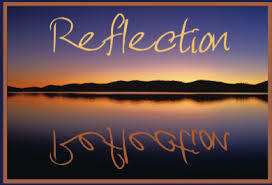 We have experienced speakers from across North America lined up for the retreat this year. Registration and the full schedule will be released very soon. SYANA 2017 Gurmat Camp Thank You! We hope everyone has had time to rest and recover after a wonderful week together at #syana2017! We wanted to thank you all – campers, teachers, sevadaars, and parents – for working together to ensure we have another amazing year at Gurmat Camp. This year, we had over 115 enthusiastic, dedicated youth, who immersed themselves in sangat for the week and inspired each other to follow the path our Guruâ€™s laid out for us. amazing path laid before us. a desire to continue to learn and share. Gurmat Camp provides a great opportunity to immerse yourselves in Sangat and meet kids just like you from all across the US and Canada â€“ spending this time can really allow for great friendships to begin, grow, and last beyond the week of camp. As we discussed during our week together, we are all part of the SYANA family. The time we spend together really does give purpose to the mission of SYANA and all of your energy and enthusiasm inspires all the sevaadars to continue to do more. We want to thank you for making the commitment to send your children to camp. The investment you are making for the future of our Sikh Panth is commendable and without your support, the camp would not be possible. This is also a great time to use the energy and momentum your kids have to institute some changes or improvements to their daily lives. You, as a family, can encourage activities like learning the translation of a Shabad each day, doing Paath together, or reading a Sikh related book. There are many simple ways in getting your children involved with the Sikh way of life. Your encouragement can really help keep the spirit alive throughout the year! Lastly, we’d like to thank all the sevaadars for taking a week out of their lives and devoting their time and effort into this camp. As Kuldeep Singh Uncle Jee said on the last day program, this (camp) is not the work of any one person but the work of a larger team. Because of your help and love for our Sikh youth, this year’s #syana2017 Gurmat Camp was incredible! Again, we all are a part of the SYANA family and if any of you have any suggestions or comments for how we can improve the camp for future years, we would love to hear them. Please email us at info@sikhyouthalliance.org. We will do our best to accommodate changes that would better the camp experience. We had so much fun with all of you and hope to see you again next year! Pictures are posted on our Facebook page and videos are being uploaded to our YouTube page. Also check out our camp video this year! Please tag yourself and comment – it’s a great way to stay in touch until the next SYANA program. We hope that you can continue to participate in activities sponsored by SYANA, and like us on Facebook often to get details for upcoming events. Please join us August 3rd – 6th, 2017 in Dunan, South Carolina for the International Sikh Youth Symposium. It will be a great opportunity to connect with friends from camp. Information is available at the SYANA website. Thank you for a wonderful week at #syana2017. We are missing the family already and starting our countdown to when we can see everyone again next year. We hope you all have traveled safely back home and are settling back in. In case you are wanting to reminiscence about our memorable week together – here is the newsletter and recap video. 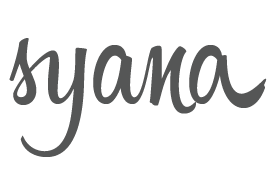 Thanks to all the SYANA team members that made the newsletter and video possible. Enjoy! Vaaheguru Ji Ka Khalsa, Vaaheguru Ji Ki Fateh! It’s hard to believe that another camp is coming to an end. We have been having a wonderful time with all of your children this week, as they have been spending their days learning from our history, being inspired by Gurbaani, and building connections with each other so that we can encourage each other on our path to the Guru. On Wednesday, students had mid-week evaluations and activities in their classes to gain a better understanding of how they were understanding the material at that point. They were also able to take full advantage of the Camp Copneconic facilities as the YMCA staff led us in water activities during recreation time (swimming for the youngest campers, while older campers could boat and inner tube) and various outdoor activities in the evening, from human foosball to capture the flag. On Thursday, students continued learning about our Gurus and Sikh leaders, as well as questioning the values that these later leaders used to make their decisions. As our teachers imbue the students with a knowledge of history and gurbaani, they are also teaching them to be critical of that which we hear and develop their own understanding of these events and figures in history with a Gurmat perspective. That evening, we finished the day with our second keertan darbaar, during which the passion and love that the youth have for singing gurbaani was loud and clear as they sang shabads they had learned throughout the week and supported their Sikh siblings while they did the same. 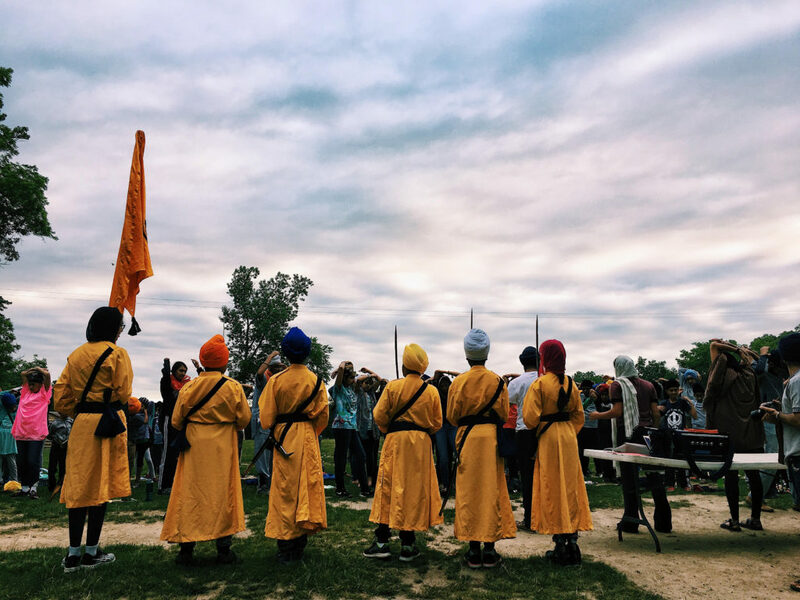 Today, students will be participating in their final day of classes and finishing the day with an outdoor divaan (weather permitting), dastaar competition, and a camp fire to celebrate their time at camp this week. We hope Vaaheguru will bless us with the ability to continue learning, supporting each other as a sangat, and always returning to our love for the Guru long after this week is over. Finally, we hope that you can join us on Saturday for our final program. During this time, you can see for yourself how much the youth have learned and been inspired this week. Beyond that, you can be inspired yourself, as they have continued to remind us of the true beauty, strength, and resilience in the Sikh panth. Please join us at 9 AM on Saturday, starting with parbaat phairee (morning parade/procession), a gatka (Sikh martial arts) demonstration at 9:20 AM, and then our final divaan from 9:40 AM until 1 PM, which will be followed by langar. We’re already two days into SYANA Gurmat Camp 2017. Our campers have been learning about the notion of Kurbaani (sacrifice) and how it has been exemplified throughout our history. 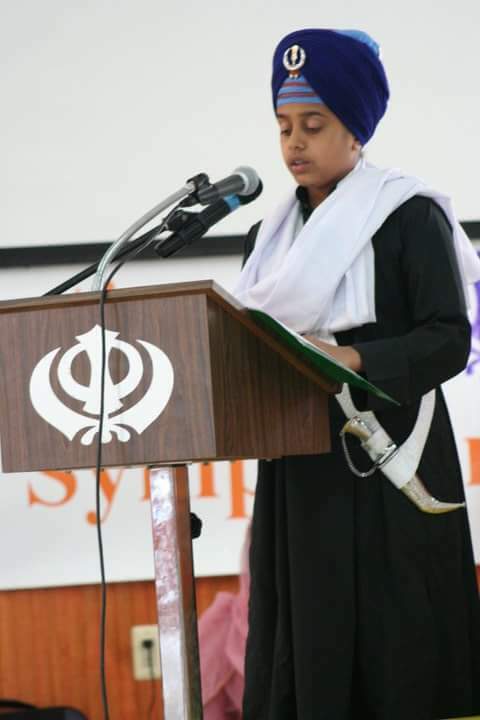 Through their history classes, students have been learning about the martyrdom of Guru Tegh Bahadur Ji and the sacrifices of Guru Gobind Singh Ji. They heard about the rule of Maharaja Ranjit Singh and thought about the requirements for building a Sikh Raj (kingdom). In Keertan class, they have been learning how to recite Gurbaani and also reflect on the meaning with help from our Sevadaars. In Gatka class, they have learned skills for defense to carry forth the essential Sikh practice of tyaar bar tyaar (always at the ready). Through these lessons, we hope to instill in the campers a notion of Miri and Piri—spiritual and worldly intellect and understanding. Our theme Shabad this year was from Guru Nanak Dev Ji: ਬਿਨੁ ਤੇਲ ਦੀਵਾ ਕਿਉ ਜਲੈ॥ਰਹਾਉ॥ Through this shabad, the campers are reflecting on how a life of focus, commitment, and love is required in order to find peace and free ourselves from attachments. While GuruJi asks how we can “light the lamp” of our life in this first rahaao pankthee, he answers the question in a second: ਇਹ ਤੇਲੁ ਦੀਵਾ ਇਉ ਜਲੈ॥ ਕਰਿ ਚਾਨਣੁ ਸਾਹਿਬ ਤਉ ਮਿਲੈ॥੧॥ਰਹਾਉ॥ It is only through an understanding of the temporary nature of our world, and a focus on Gurbaani and seva, that we can peace in this world and a place for ourselves in Guru’s darbaar. Finally, perhaps the most important part of camp is the bonds and friendships that the children will build and carry into the future. Within two days, the campers have already become close with their group members and their counselors. 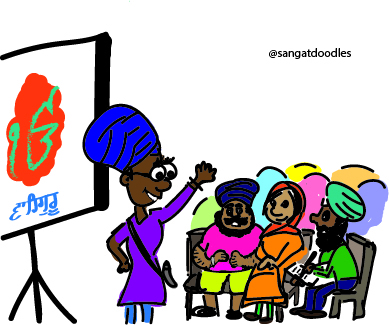 They are having intimate conversations about how to practice their lives as Sikhs within their communities and are drawing inspiration from their counselors and teachers. With Guru’s blessing, we hope to continue to grow and learn for the rest of the week. The SYANA annual Gurmat Retreat is upon us and we are so excited to meet up with familiar faces and make new friends! 1. Don’t forget to post your travel pictures on our Facebook page #syana2017. 2. Weather throughout the weekend is supposed to be in the mid 70s – The campsite is on a lake so the morning and evening tend to be cool. Please pack appropriately. 4. Don’t forget your towels and bedding. 5. For the most accurate directions please use the map on our site: Retreat Directions. 6. We will have access to email during the day but for emergencies please call Inderpal Singh (847) 226.0690 or Mandeep Singh (314) 537.5669. 1. Weather throughout the weekend is supposed to be in the mid to high 70’s – The campsite is on a lake so the morning and evening tend to be cooler. Please pack appropriately. 5. We will have access to email during the day but for emergencies please call Inderpal Singh (847) 226.0690 or Mandeep Singh (314) 537.5669. We are very much looking forward to this weekend – it will be a weekend of remembrance, reflection and analysis and we cannot wait to share this with all your Sangat. Please think about sharing a favorite poem, essay, song, or instrument. We would love to hear your voice! 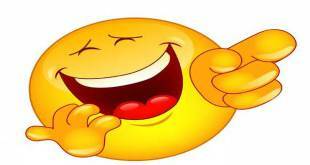 Please bring five of your corniest, funniest, “punniest” jokes as we prepare for Retreat! They will come in handy on Friday!! Vaaheguru Ji Ka Khalsa Vaaheguru Ji K i Fateh! 1. We are having a poetry/open mic night on Sunday evening. Please think about sharing a favorite poem, essay, song, or instrument. We would love to hear your voice! 2. If travelling by air/train/bus, please email us complete info at: info@sikhyouthalliance.org. 4. Don’t forget your bedding and towels, and please come prepared for outdoor activities! 4. Gurmat Retreat begins with registration at 4:00pm on Friday, May 26th and concludes with lunch on Monday, May 29th at 1:00 pm. 5. The address for the campsite is: YMCA Camp Storer 6941 Stony Lake Road, Jackson, MI 49021. Please let us know if you have any questions. We will see you soon!